The Haiti Goat Project is designed to help Haitians develop the skills to raise goats. The project provides both food and income for the family. 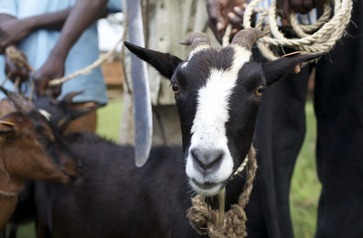 For $50 (U.S.) a female goat is purchased and given to a family who is trained in basic care. That goat is bred and the first kid kept by the family, the second given to the community, the third kept by the family and so on. The community goats are given to new families, who in turn are trained and repeat the cycle. Male goats are sold and the money used to purchase additional female goats. Twice a year the goats are inspected and vaccinated. Since the program began, over 1,000 goats have been placed with families through 56 local churches.